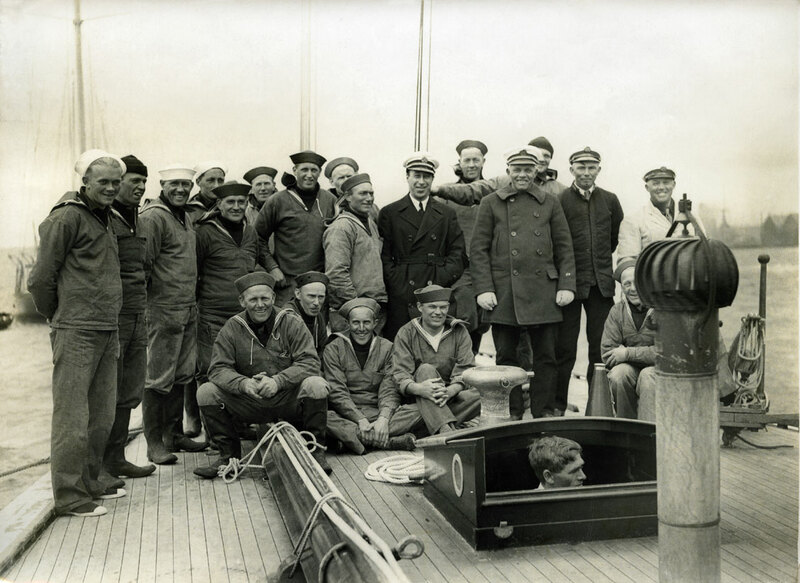 This website recounts the story of Tysnes (on the west coast of Norway) emigrants to the USA who became professional crew members on American racing and leisure yachts between 1900 and 1940. The first American yacht clubs saw the day of light during the mid-1800s. Sailing races eventually grew in popularity, especially on the US east coast. Wealthy Americans acquired sailing yachts, and soon found themselves in need of crews to prepare, maintain and sail their boats. Winning the America’s Cup was considered a great honour among American socialites, who spent a lot of money and prestige on the matter. The Word jaatt (spelled “jått”) is the local word for ‘yacht’, pronounced like its English equivalent (in the rest of the country, however, the word is spelled as in English). Before long it became a household name, as an increasing number of Tysnes men signed on board these vessels during the first three decades of the 20th century, up until the outbreak of WW2, in 1940. A number of these men were full-time sailors for the entirety of their adult lives, whereas others were in it for a couple of seasons, otherwise engaged in other occupations, but in sum total, a great percentage of the male Tysnes population was involved. The book Tysnessoga (The Tysnes History) volume 2 states that approximately 250 Tysnes locals were steadily employed in the American yacht fleet during the 1930s, most of whom from the northern parts of the Tysnes isles, from Malkenes in the east, to Våge in the west. But other rural Tysnes districts were involved, too. A great deal of them had their permanent addresses in the Tysnes community, sailing overseas during summer, and returning to the old country at season’s end, in the autumn. Others relocated to America on a permanent basis, or returned to Norway at the end of their sailing days. In the 1800s Tysnes was a regular island community on the Norwegian west coast. Farming, fishing and maritime employment were important elements in everyday life. Boats were crucial in people’s lives, and were natural parts of the existence. The 1800s saw an increased demand for larger vessels, used in the transportation of goods along the Norwegian coastline. Especially important was the Nordland trade (trade with the country’s northernmost parts). Northern Norway was – and remains to this day – abundant with fish in need of transportation to Bergen (the city closest to Tysnes), while other goods needed transportation the other way. A great number of Tysnes locals made investments in freighters. Sloops and hermaphrodite brigs/schooners were a common sight in the Tysnes area, of which the Hardanger sloops soon came to dominate the fjords and harbours in and around Tysnes. At the end of the 1800s a great many Tysnes inhabitants were employed in this activity for long stretches of the year. By 1893 64 larger vessels were registered in Tysnes, providing employment for 315 men. Many a young boy, aged downwards to approximately 14 years, signed on in order to learn seamanship along the rough-weathered coast of Norway – an experience that would soon come in handy, for those later emigrating the the USA. The Hardanger sloop’s golden era soon came to an end, as local population figures rose. By the year 1900 the Tysnes community counted 4667 heads. Getting jobs soon proved to be a challenge, and a lot of Tysnes locals followed the example of people elsewhere, in relocating to America. In America sailing had grown its popularity immensely by the turn of the century. Crews, able to maintain and sail luxurious yachts of all sizes, were in high demand, and on the increase. At this time owners frequently hired Scandinavian crews to sail their boats, be it for regatta or touring purposes. Engel Vaage (also known as John Christensen, 1875–1944) was the first “Tysnesing” to sign on board to a sail yacht around the year 1900, soon to be followed by many. They rapidly advanced in rank, among other things to mates or captains – or sailing masters, as they were called. These, in turn, had an influence on choice of crew, which explains how a small local community on the coast of Norway came to be a dominant provider of yacht crews up until 1940. Please hold mouse over “The History” in upper left menu, for sub menus relating to the story of America’s Cup and The Norwegian Steam.